Segway guided tour around Palma de Mallorca Old City. 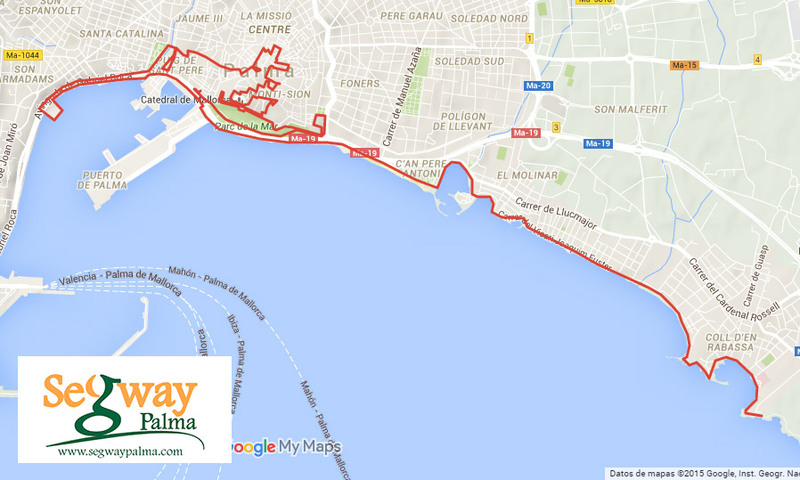 Route along 500 years of history: Parque del Mar, Baluard des Príncep, Dalt Murada, Arabic Baths, "La Seu" Palma Cathedral, Almudaina Palace, Santa Eulalia Church, Plaza Mayor, Churches of Palma, Patios Mallorquines, Modern Art Museum "Es Baluard". Our all-around segway tour, the best way to discover Palma de Mallorca. 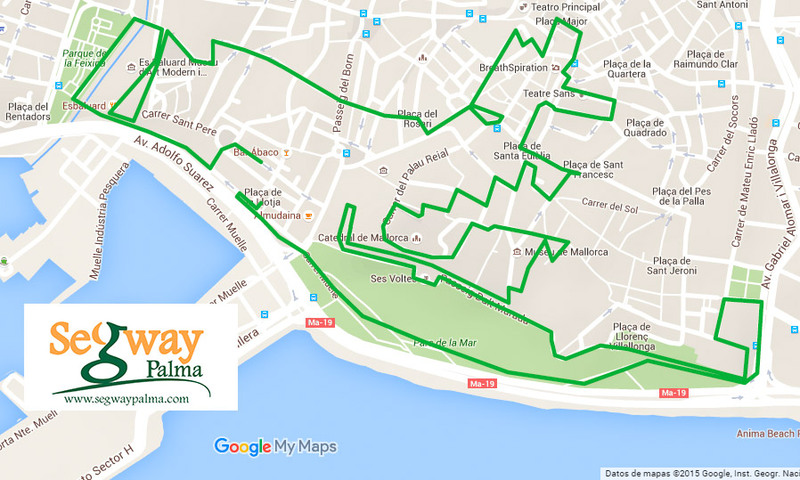 Enjoy our segway guided tour around Palma Old City during more than one hour. And after that, we take you to enjoy seafront. You can choose to visit the harbor and its luxury yachts, or head to the Portixol area along the beach. If you're a segway fan, and two hours is not enough for you, this tour is for you! 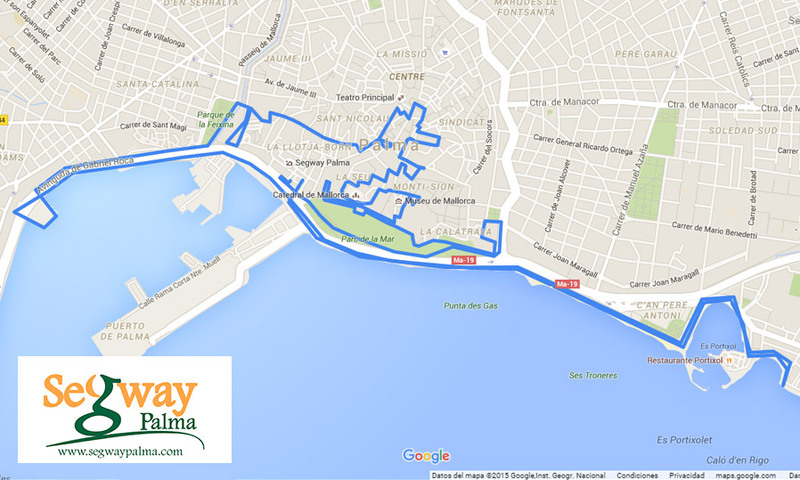 Route of more than one hour along Palma Old City visiting most interesting places. After that, we take you to enjoy the Bay of Palma, riding seafront, visiting Paseo Marítimo, Portixol, Ciudad Jardín Beach and Cala Gamba. We take a break for drinks, always in a special place, before coming back. Is it enough for you? Book in advance. We always recommend you to book in advance to be sure there is availability. This is specially important during summer. Bring closed and comfortable shoes. We recommend not to wear flip-flop's. Use Sunscreen, specially in summer. We make six-person groups. If you're less than that, you'll meet new people. Private tour: you can book a private tour if you want, with an extra cost of 20€ per person. Minimum age: Minimum age is 10 years old. Weight: Minimum weight is 40 kilos, maximum 120 kilos. Alcohol and drugs: It is not allowed to take alcohol or drugs before or during the segway tour. 5 minutes walking from the Cathedral or Plaza la Reina. Next to Lonja Square. Had some good instruction then headed off for a great couple of hours, great guide, see the back streets and cover loads of places that you wouldnt normally see. Would recommend it for families and couples. The tour of Palma was superb. It was so brilliant I would recommend it to anyone and we will definitely be back. One of the best things we have done on our hitlist for 2015! Our children 12 and 15 loved every minute and was well worth the money. Would highly recommend this tour company. Don't stay out! Make your reservation in advance and get ready to discover Palma de Mallorca the best way with our segway guided tours! Do you have a question? Don't hesitate to ask us! Do not hesitate to ask us any questions you may have, we will attend gladly.